Rain didn’t get where he is by dressing badly. In the past week or so, with a lot of things I was trying to keep OFF my mind, I watched more Korean variety TV than I have consecutively…well, ever. And let’s hope never again. My dreams get full of hubris and beautiful Asian eyes. 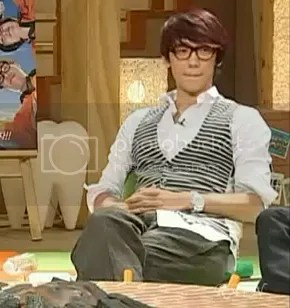 These are just two outfits from Rain’s promotions of…well, actually Ninja Assassin, I think? But maybe one is from one of the albums. These are at least in the same family of shows, if not the same one, so there may be some time separating them. Like on the last post, they’re screencaps I took my own self from YouTube, and not on HD. But you’ll get the point anyway. Heh. Maybe his psuedopreppy look is helping? 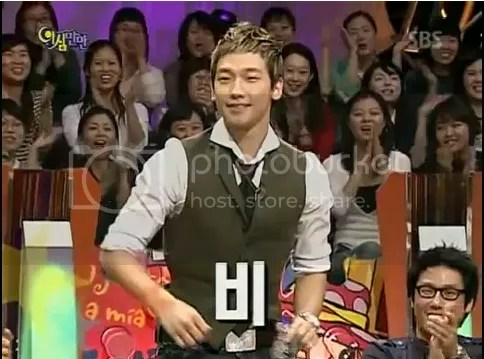 Though Rain’s best attribute, as far as his acting’s concerned, is his ability to go from fun-loving goof to very earnest in a split second. It’s interesting that not just here, but in the next set of photos, he’s going for a classic combo of vest over collared shirt, with slacks. In this case, he’s got glasses to take that image one step further, into hot Megane-kun territory, in the other case he adds more of a rocker vibe by wearing a tie layered with a large flashy necklace. It actually looks like a riff off of school uniforms, though maybe I’m being influenced by the fact that the green and plaid look like one of the high school uniforms in my Japanese hometown… like, the thing a punk might do, or a manga artist might do on a front-piece of a chapter. ‘course if the sleeves weren’t rolled up it wouldn’t be the same. Weirdly in this photo I’m almost missing the glasses. I wonder if he really needs glasses at all? Because that would be kind of hot in that manga-secrets way. TOP does, surely you can get with the program, Rain-sunbae? I really have tried to hold out against Rain, because he’s so superpopular he really doesn’t need my love. But at the same time…he’s a ferociously hard-working and talented guy. How’s a girl supposed to deal? Talent is like, my Achilles heel.